Home to Mount Nguaruhoe, Mount Tongariro and Mount Ruapehu, Tongariro National Park hosts a unique cluster of volcanic activity seldom seen anywhere else in the world. The three mountains create the Tongariro volcanic zone which injects both excitement and beauty into the region. Winter is around the corner and the Tongariro volcanic zone will soon be laden with fresh, powdery snow. We’ll see thousands of visitors flock to the region to make the most of the slopes for the skiing and snowboarding season. 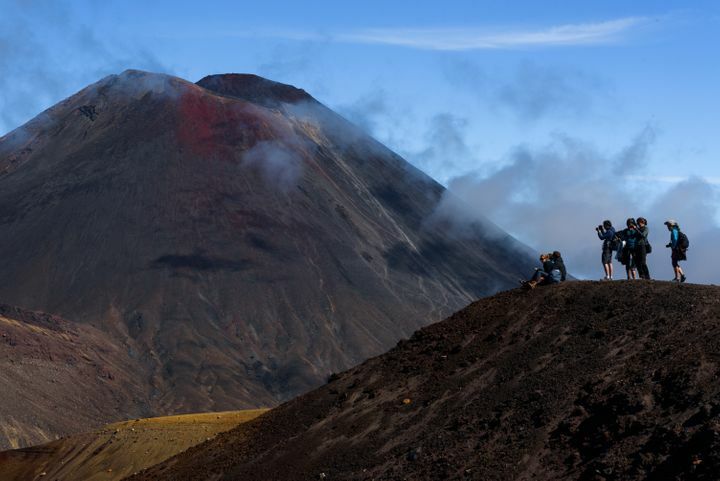 It’s always good to know a bit about the places you travel to and the Tongariro volcanic zone is so full of interesting history and geology that we’d love to share with you. Tongariro translates to ‘fire carried away’ or ‘seized by the cold south wind’. Formed over 275,000 years ago by a series of eruptions, Mount Tongariro is a composition of lava and other volcanic fragments. Mount Tongariro is a steep volcano with a height of 1,978 metres and consists of 12 cones. The most famous vents along Mount Tongariro’s massive complex are Te Maari Crater, the Red Crater and Mount Ngauruhoe, each of which was formed at different stages of the volcano’s history. With over 70 eruptions from various vents since 1839, Mount Tongariro is alive and well. The most recent eruption came from the Te Maari Crater in 2012 which sent large volcanic rock as far as two kilometres into the air. The extensive ash cloud was reportedly seen as far as Napier and the smell of sulphur was reported as far as Wellington, Nelson and Blenheim. The volcanic activity has paved the way for the creation of one of New Zealand’s most famous walking tracks, the Tongariro Alpine Crossing. Those who trek the Crossing are able to get up close and personal with the many stunning features of this historical volcanic activity. Striking Emerald Lakes fill explosion craters, ancient lava flows form plunging waterfalls and volcanic fragments scatter the walking tracks. Mount Tongariro is the result of thousands of years of slow formation and nature has designed a true spectacle for us to enjoy. Many are unaware that Mount Ngauruhoe is geologically a cone of Mount Tongariro. With an impressive height of 2,291 metres, Mount Nguaruhoe is regarded as a separate volcano in the Tongariro volcanic zone. Rising above its neighbouring volcanoes, Mount Ngauruhoe is a striking figure in the Tongariro National Park and looks just as you would imagine a volcano to look – a perfectly-formed peak. In winter, when blanketed in snow, Mount Ngauruhoe stands out in the distance. When summer hits and the snow melts, you’ll see that the volcano is completely free of vegetation. The entire cone is covered in material from recent eruptions. Mount Ngauruhoe is the youngest and most active of Mount Tongariro’s cones. It began forming around 2,500 years ago from alternating layers of lava, ash, scoria and other volcanic debris. The first recorded eruption was in 1839, but Maori artefacts suggest eruptions were happening long before European colonisation. Until 1975, Mount Ngauruhoe was recorded to have erupted every nine years. However, the once highly-active volcano has now been resting for over four decades. Trekkers are able to climb to the summit of Mt Ngauruhoe during their walk through the Tongariro Alpine Crossing. It’s a steep 1.5-hour climb with loose rock underfoot, so it’s advised that only capable hikers attempt this climb. Mount Ngauruhoe has made several appearances on screen. The first was in 1974 for an advertisement for Moet and Chandon where champion skier Jean-Claude skied the eastern slope. The second was as Mount Doom in the Lord of the Rings trilogy which put Mount Ngauruhoe on the world stage. Our beloved Mount Ruapehu is home to the best ski fields and only glaciers in the North Island. This treasured volcano brings joy to skiers and snowboards from far and wide during the winter season. Mount Ruapehu is the largest volcano in New Zealand. It spans across three major peaks, Tahurangi (2,797 m), Te Heuheu (2,755 m) and Paretetaitonga (2,751 m). Between each peak is a deep crater that fills with water between eruptions. Mount Ruapehu began forming over 250,000 years ago from layers of lava and other volcanic material. In recorded history, trends show Mount Ruapehu’s eruptions happened every 50 years. The last major eruption was in 1995 after having shown signs of increased activity. The thick ash cloud was reportedly seen right across the North Island and, as it fell, blanketed the ground in a sand-like substance. Since then, Mount Ruapehu has had a series of smaller, sporadic eruptions as well as plenty of warnings of heightened activity. Mount Ruapehu has two commercial ski fields, Whakapapa and Turoa which are the largest in New Zealand. Whakapapa sits on the northern side and Turoa on the southern side. To the east is Tukino ski field, a club-operated section of the mountain that is open for public use. With the ski season approaching, Mount Ruapehu will come to life with the bustle of snow-seekers looking for a great day on the slopes. As the weather starts to cool down, the snowy white peaks will soon appear along the Tongariro volcanic zone. Tongariro National Park is so rich in history, culture and geology and this is the reason many visit the area. A trip to the Tongariro region is full of excitement and outdoor adventure thanks to our resident volcanoes. Located in the heart of Tongariro National Park, The Park Hotel is right amongst the action. It’s now the perfect time of year to plan a trip to the region in preparation for the Mt Ruapehu ski season. As this is one of our busiest seasons, book with us in advance to secure comfortable, quality accommodation with easy access to and from each of the ski fields. Best of all, you can experience the Tongariro volcanic zone for yourself. Call us today.